Bicycles throughout the world are made with standardized, interchangeable parts. Unlike many modern products, the technology used in bicycles is simple enough to allow many riders to repair their own vehicles with a minimum of effort. For any cyclist, bicycle maintenance is a particularly useful skillset to acquire. Every skill learned in this area---no matter how simple or complex---can aid in keeping your bike in good working order, save you money, and make the difference between pushing your bike home or riding it. 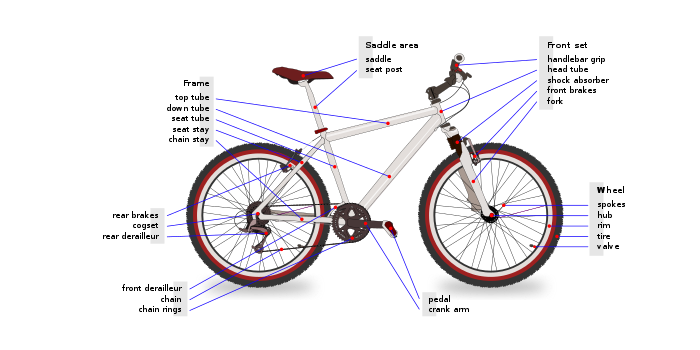 Gear-changing Dimensions:Tables with gear shifting data. This page was last edited on 14 December 2015, at 09:50.